4 How happy I was to meet some of your children and find them living according to the truth, just as the Father commanded. 5 I am writing to remind you, dear friends,  that we should love one another. This is not a new commandment, but one we have had from the beginning. 6 Love means doing what God has commanded us, and he has commanded us to love one another, just as you heard from the beginning. 7 I say this because many deceivers have gone out into the world. They deny that Jesus Christ came  in a real body. Such a person is a deceiver and an antichrist. 8 Watch out that you do not lose what we  have worked so hard to achieve. Be diligent so that you receive your full reward. 9 Anyone who wanders away from this teaching has no relationship with God. But anyone who remains in the teaching of Christ has a relationship with both the Father and the Son. Greek, I urge you, lady. Not specified in Bible text. Strong lighting coming in through the open door illuminates all the people on the left, with strong shadows on the right. 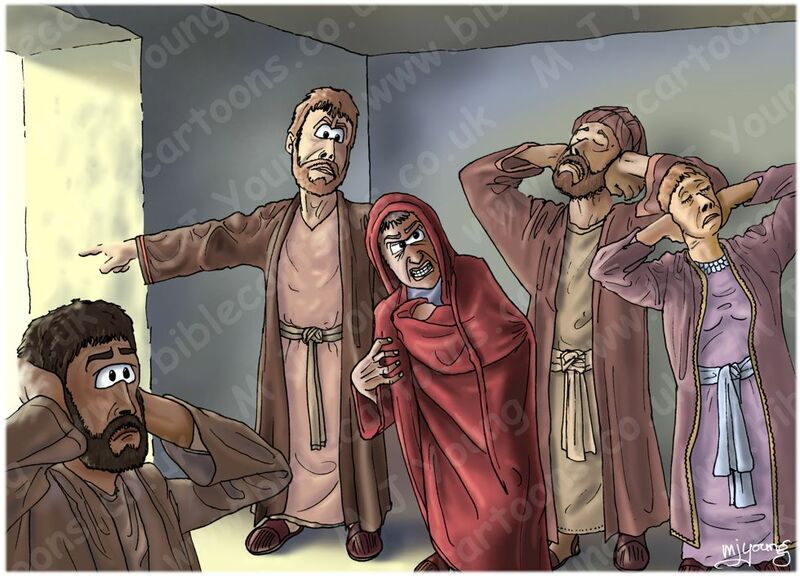 The false teacher/deceiver is the man in red in the centre of the picture, with an angry, hateful expression. The other people are Christians in the local church, one of whom is indicating the open door & throwing the deceiver out. I decided to make the false teacher (deceiver) partially covered in a red robe, with claw-like hands & a hateful expression, so the viewer can be clear who is who. I suppose truly dangerous false teachers look pleasant, happy, etc & so are ever more deceptive. I have departed from my normal practice of drawing women with long hair, in that the figure on the extreme right is a woman with quite short hair. 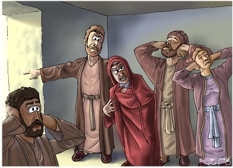 Apart from the man pointing to the doorway, the other people present all have their hands covering their ears, indicating that they are “closed off” to the false teachers deceptive words.